For two decades, Maria De La Luz Hernandez has been involved in the Monterey County Real Estate business. During that time, she has established herself as a First Time Home Buyer Specialist that is passionate about helping her clients find their dream home. Maria's innovative new construction expertise sets her apart from any other in the business, and will assure you find the best quality home for your money. 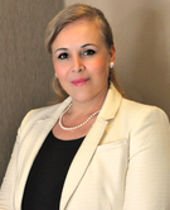 Maria holds an Associate's in Science Degree in Business and Accounting, and is fluent in conversational Spanish. This could be a very profitable Dry Cleaning business with a stable client base. Shopping center is conveniently located in north Salinas. Steinbeck Real Estate's Rising Star - Monica Wason! 12 West Gabilan Street, Salinas, CA. 93901- Steinbeck Real Estate's Salinas Valley Brokerage with exposed, aged red bricks contrast with the materials of the Taylor Building courtyard. Vibrant and comfortable urban feel, equally ideal as a creative working environment. Located in Salinas City Center home of John Steinbeck, The National Steinbeck Center, 1st Friday Art Walks, Holiday Parades, California Rodeo Salinas, Como del Rodeo, Salinas Airshow and the Old Town Salinas Farmers Market & Salinas Valley Food & Wine Events. Our Carmel-by-the-Sea branch is centrally located downtown overlooking the bustling Su Vecino Courtyard on Dolores & 5th Streets amongst Steven Whyte Sculptor Gallery & Studio, above Cultura Comida y Bebida Carmel & across the street from Lafayette Bakery & Cafe. Steps from The Carmel Post Office famed Bennett Sculpture Carmel and The Carmel by the Sea Fire Station.